Have you ever had raclette? It’s an amazing meal and experience. If you’re planning a party, you should definitely try hosting a raclette party. 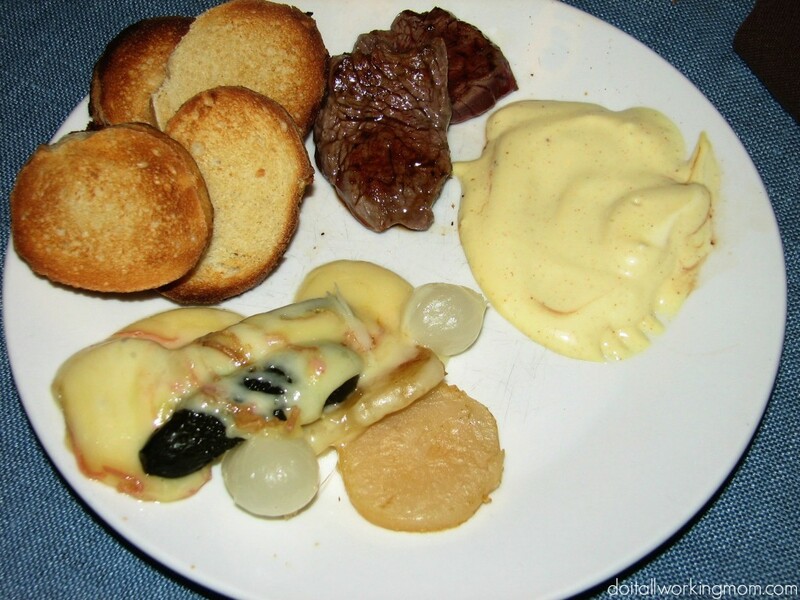 A raclette is dish from Switzerland, where cheese is heated and scraped onto a dinner plate. We use an electric table-top grill with small pans in which we melt the cheese. The cheese is then scraped over food on a plate. You can also place the ingredients in the little pans, place slices of cheese on top, and then melt the cheese. A raclette dinner party is relaxing and so much fun. You can appreciate delicious food, while enjoying great company and a few glasses of wine. A raclette dinner party can last for hours, which makes it even more fun! Raclette is perfect to celebrate a special occasion. My kids really enjoy raclette, so it’s my go to meal when I want any dinner to feel special. 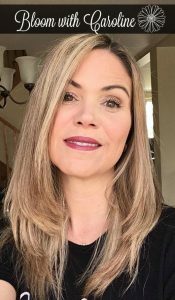 It’s perfect for any occasion: Valentine’s Day, the Holidays, to celebrate a Birthday, or for a family fun night. It’s the easiest and most fun party you’ll host, and it’s so good. At our house, we have a least 4 raclette dinner parties per year. It’s that good and that fun!!! 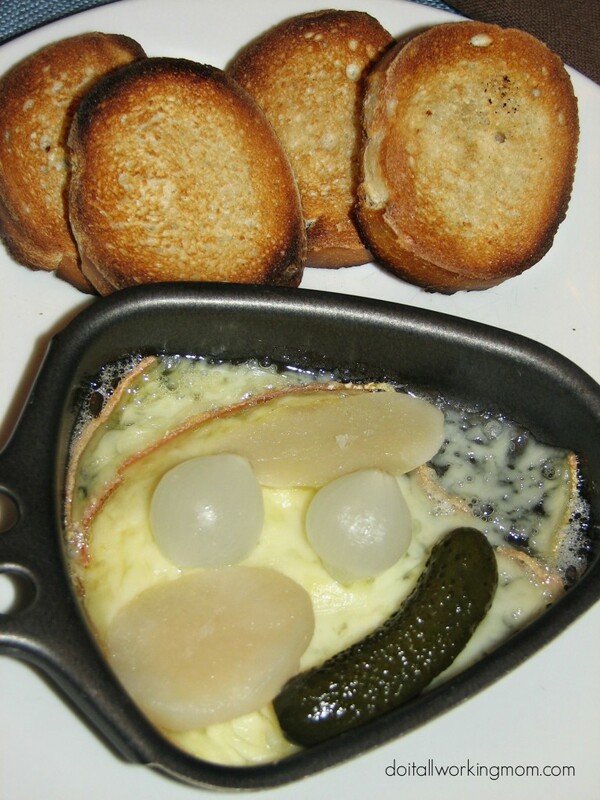 There aren’t really any recipes when it comes to raclette, the possibilities are endless. 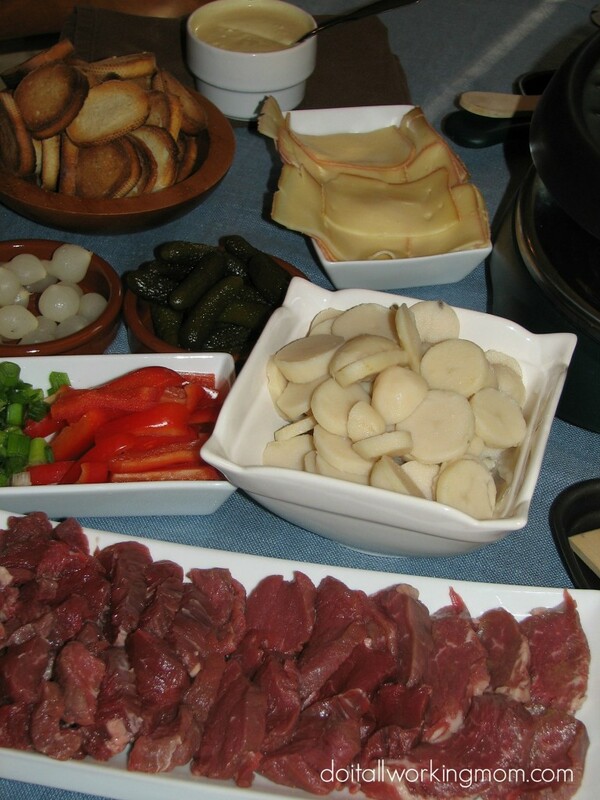 Here are the most common ingredients your serve during a raclette, but don’t limit yourself to those, be imaginative! Charcuterie (ham, dry salami, dry sausage, viande des Grisons). Sliced raclette or gruyère cheese (I get mine at Costco). Green onions, broccoli, mushrooms, zucchinis, red peppers, cherry tomatoes, chives. Thin slices of uncooked filet mignon. Thin slices of uncooked chicken breast. You can make dips to accompany your raclette. We like dijonnaise (3 tablespoons of mayonnaise mixed with 1 tablespoon of Dijon mustard). Serve with thin slices of fresh and grilled baguette bread (I prefer mine grilled) and a green salad (optional). 1- Set you table and place your raclette grill in the middle of the table. 2- Place all your ingredients on the table in bowls and platters (you can set a small table beside if you need more space). 3- Heat the grill (I add non stick cooking spray to the grill). 5- Cook or heat your favourite ingredients on the grill then top with cheese you previously melted in a pan underneath the grill, or place your cooked ingredients in the pan, top with a piece of raclette cheese and grill the cheese. 6- Keep on eating and pouring the wine! This is the perfect menu to serve your family and friends. Now are you ready to host a raclette dinner? I´m Julio from Spain, i´creating a site about raclettes (http://racletteya.com) and i get to your site from pinterest. 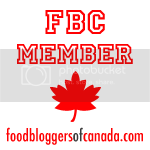 I´ve just pinned it :D.
Just saying hi, thanks for the article and greats photos! I’m new to Raclette cooking myself but so far I’m loving it. Your ideas are great! Thanks! We love a nice raclette dinner. It’s different and so much fun!